Eighteen suspects have been given aggravated life sentences while five received life sentences and an additional 10 years in one of the trials concerning a July 15, 2016 failed coup, the first sentences handed down to suspects in the ongoing coup trials. 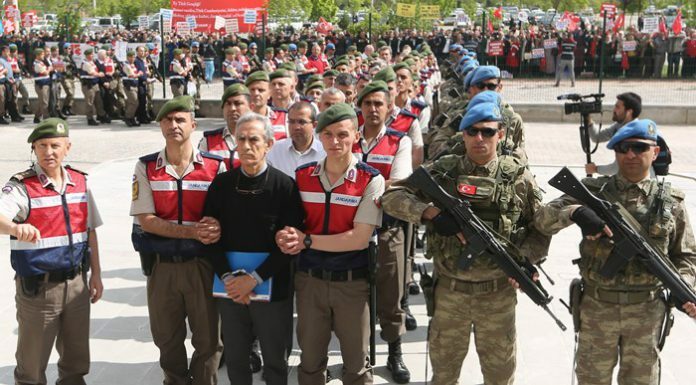 The trial, held at the Ankara 13th High Criminal Court, concerns the taking hostage of Fahri Kasırga, the presidential secretary-general, on the night of the coup attempt, which claimed the lives of more than 240 people and injured a thousand others. The suspects who were given aggravated life sentences were convicted of attempting to destroy the constitutional order. They also received an additional 12 years on charges of deprivation of liberty. Coup plotters forced Kasırga to get in an ambulance on the night of the coup attempt and took him to the Akıncı Airbase in Ankara. Kasırga was held in a locked room at the airbase until his release following the suppression of the coup attempt on July 16.